Compute-intensive tasks like displaying elaborate animation produced by media center software are not the ideal applications for a Raspberry Pi. In spite of its admittedly limited resources, the Pi nonetheless manages to do a credible job of handling such tasks. Adding just a bit more CPU power allows the Pi to do an even better job. 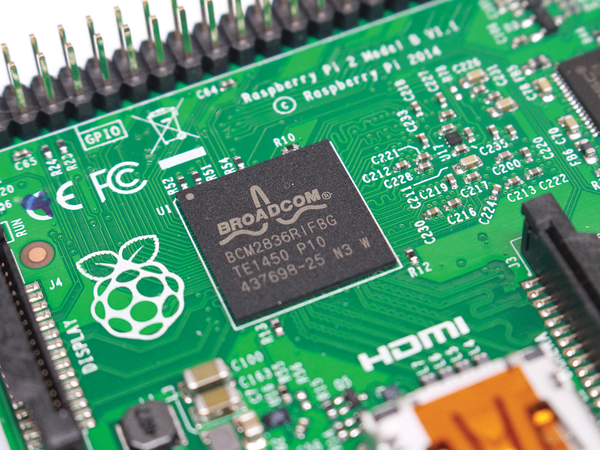 Broadcom designed the  CPU built into the first model of the Raspberry Pi to be used at clock rates up to 1GHz. However, the developers were not sure how the nano-computer would keep up day to day without a fan and heat sink, so they played it cautious and set the clock rate of the first-generation Pi at 700MHz. Even so, they wanted users to realize the CPU's full potential, so they made it possible to overclock the Pi with software. In the beginning, overclocking came at the risk of voiding the warranty, but after receiving loads of feedback from the user community and performing a number of tests, the Raspberry Pi Foundation finally decided to sanction overclocking . The Raspberry Pi 2 (RPi2) comes equipped with a quad-core processor (Figure 1) that runs at 900MHz and is significantly faster than first-generation Rasp Pis. The foundation refers to computing performance that is six times better on the average. Provided the configuration is correct, the overclocked CPU can achieve a rate of up to 1.1GHz. Figure 1: The Broadcom BCM2836 used for the second-generation Raspberry Pi can be overclocked from 900MHz up to 1.1GHz. Unlike Xbian, the Kodi distribution Open-ELEC does not make it easy for the user to overclock the Raspberry Pi. Xbian offers a graphical dialog as one of its configuration tools, but with Open-ELEC, the user has to edit the system configuration file. The user can accomplish this in one of two ways: Take the memory card out of a Rasp Pi loaded with Kodi and edit the file on another computer, or log in to the nano-computer over a network and modify the file remotely. For the first option, unplug the Rasp Pi from the power supply and take out the memory card. To read the contents of the card, insert it into a microSD card reader or an SD card slot with a microSD adapter. The config.txt file  is in the main directory of the system partition for the OpenELEC system and can be opened with the text editor of your choice. Figure 2 illustrates this process on a Mac; however, the partition is formatted as a Windows filesystem, so the process works just as well on Windows and Linux operating systems. Figure 2: The Rasp Pi configuration file can be read with an SD card reader on any PC and edited with the text editor of your choice. 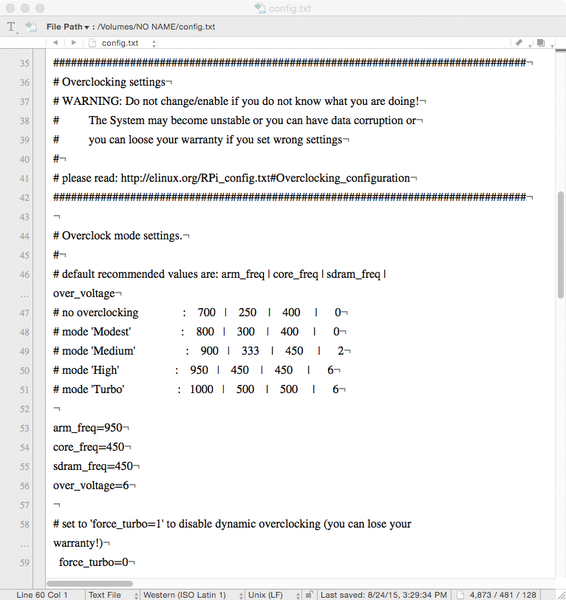 If the media center you are dealing with is hidden behind a mountain of other home electronics, then the second approach to editing the configuration file will probably be the better choice, because you won't need to shut down the Rasp Pi itself. Instead, you simply communicate with it via the network. To create an encrypted connection to a remote device, use a secure shell (SSH) client program. The system can then be controlled via the command line from another computer. Suitable software programs make it possible to transfer files between the connected devices. To set up communication, you first need to authorize logins via SSH over the network by going to System | OpenELEC | Service and finding the OpenELEC configuration tool under OpenELEC. Then, you should select Enable SSH to log into the network via SSH. You can then read the IP address allocated for OpenELEC under System | System info | Summary (Figure 3). Figure 3: The system information for the Kodi media center contains a number of interesting details in addition to the system IP address. As a Windows user, you need an SSH client like the open source PuTTY . Simply download the putty.exe file and execute it by double clicking from the Explorer browser. Under the Session Category, enter the IP address of the OpenELEC installation (Figure 4) in the Host Name (or IP address) field. Clicking Open at the bottom of the PuTTY configuration window creates a connection. As part of this process, you accept the as yet unknown key and log in as root with the password openelec. Figure 4: The SSH client PuTTY is free and open source. For Windows users, it is also the best SSH client to use when logging on to a Rasp Pi that is running OpenELEC. The password here is also openelec. If the router for the network resolves computer names correctly, you skip over the IP address adjustment and abbreviate the command to ssh root@openelec.